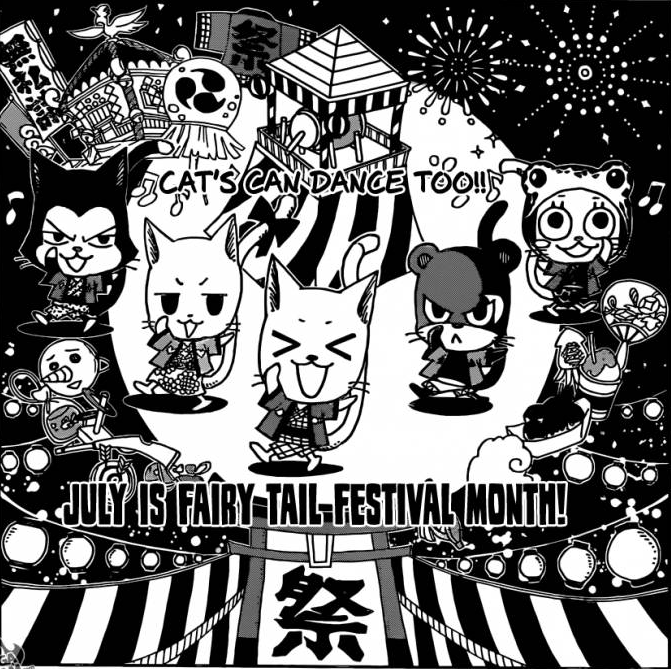 Otaku Nuts: Fairy Tail Chapter 337 Review - See Ya Later, Natsu-Hater! Fairy Tail Chapter 337 Review - See Ya Later, Natsu-Hater! Mick Jagger Has Nothing On These Cats! Am I the only one a bit saddened here? So we start from exactly where we left out last week, where Natsu had just smashed the Eclipse Gate with F.Rogue's and Motherglare's faces. Everyone waits and suddenly, every dragon there glows in a big bright light as they start to get sent back to their own time period. Almost none of them seem particularly happy about this, most notably Zirconis who gets angry and starts cursing a lot. The Princess decides to go over to Zirconis and apologise for causing this rift, as the dragons should never have entered their time period at all. Along the way, she also tells Zirconis her name and that her name is the same as the colour of Zirconis, Jade. Clearly, this is what gave him the idea to call himself that. He then disappears, feeling stupid for not attacking them some more. That Moment When You Realise How Gay You Look. And so we say goodbye to Zirconis, Atlas Flame and more as they are now all completely gone back to their own timeline. This includes those little minion bastards of Motherglare, who have been keeping everybody fighting throughout these chapters. However, Gajeel and Cobra both notice something which Mavis lets us, the reader, know. Sting and Rogue are also upset about this recent development, but Rogue cheers them up and lets Sting know that it's alright because their comrades are safe. 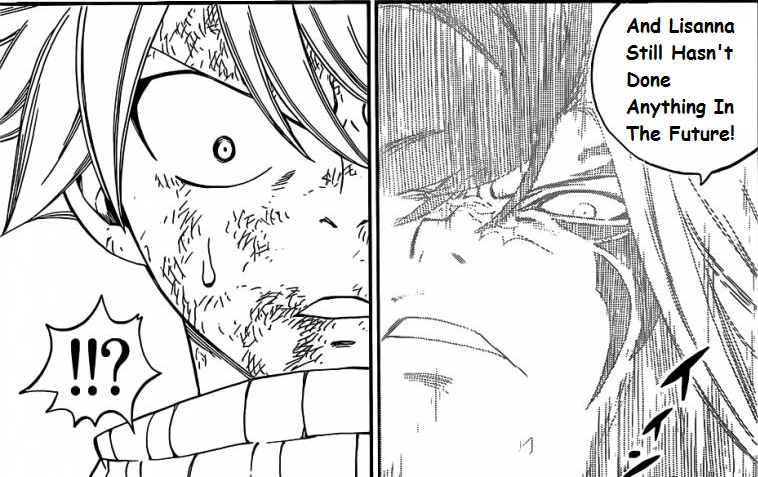 However, F.Rogue has a different message at the moment, as he glows and shares his final words with Natsu. To put it simply, Rogue has always been fighting the shadows that live inside him, and when Frosch died, F.Rogue gave up and let the shadows turn him evil. If Natsu doesn't tell Rogue that, Frosch will die in one year. Meanwhile, F.Lucy's body is also being sent back and because of time turning backwards, she and everyone who had died over the years because of evil dragons and Acnologia, are back and alive in their own time period. 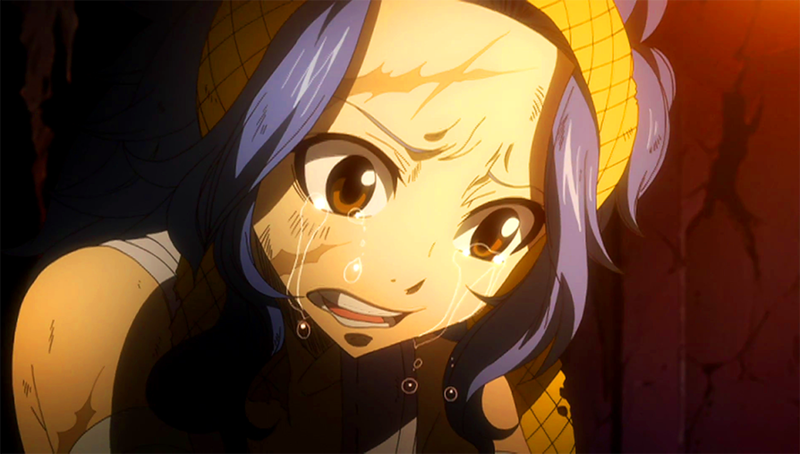 F.Lucy sheds a few tears as she sees the guild again, including Natsu and Happy. And the chapter ends with her hugging F.Natsu, standing in the Golden Plains and ready to continue her life. I Think I Can See Gajeel, Mirajane, Makarov and... Cobra? So this arc seems to be over. 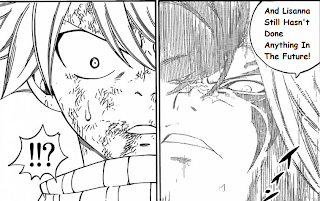 It does seem strange to me that the battle with F.Rogue suddenly ended so quickly, although it does take a while to remember that technically Natsu started his fight with F.Rogue in Chapter 324. That's 13 chapters which is a good amount. On the other hand, seeing almost none of the Dragon Slayers do battle with their opponents was a little annoying, with Mavis' words only just helping a little there, as we all know the final result. Which brings me to my next point. Carla's premonition. She predicted a tower collapsing, as Lucy sang inside it. Yet we didn't see one mention of this throughout the entire arc, except from Carla. This makes me think that we'll see this occur in a different arc completely. Another thing about the future I wonder if Future Levy. We saw her write a letter to Lucy, crying and telling us people who had died. If that doesn't appear later in the series, I'll be extremely disappointed as I spent ages wondering who these people would be. Talk About A Female Teasing Me! 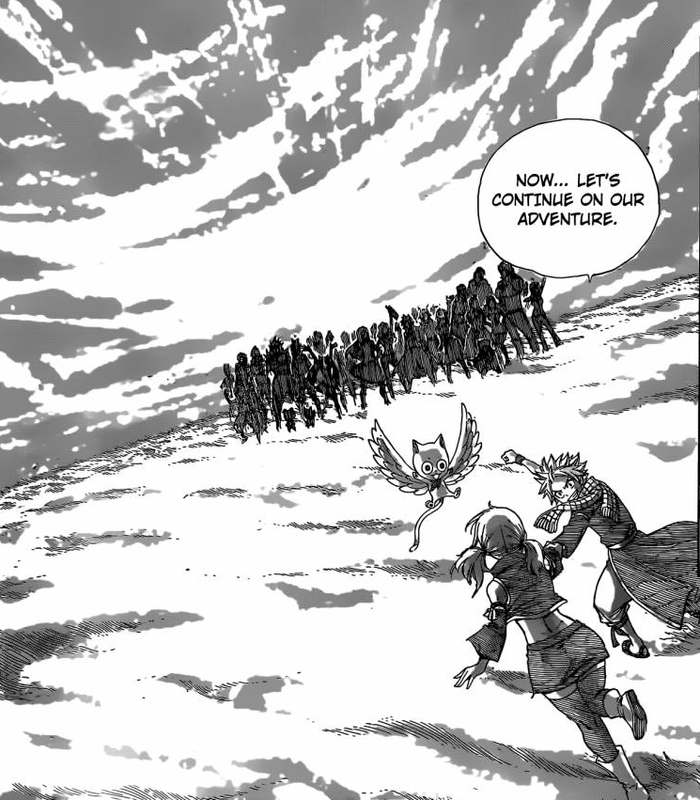 Overall, this chapter had ups and downs, including how the Dragons had a nice farewell and this new revelation that the Dragon Slayers are too weak to defeat the Dragons is clearly setting up for the next arc. 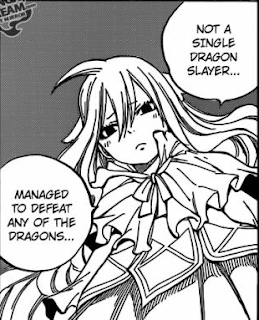 Sadly, F.Rogue's departure feels too soon and not actually seeing some Dragon Slayers fight will always remain tragic to us. Overall Character of the Week: Rogue Cheney for saying giving words of encouragement, despite having lost tragically to the Dragons themselves. Predictions: After the fun chapter where everybody talks and laughs together while healing (maybe we'll see more of Nurse Erza), we'll move on and the set-up for the next arc will begin. This might possibly include all 7 Dragon Slayers travelling together to some brand new place or to find someone, like maybe one of the top 4 Wizard Saints. 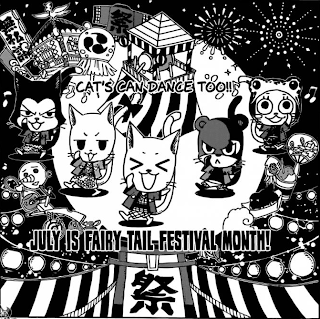 P.S Over the next two weeks, Hiro Mashima is going to give us 150 pages of Fairy Tail! Therefore, I shall do a collective review each week instead of reviewing each chapter individually. Unless, one of you has a better idea of course. I'm going to be honest. I don't think it's that at all. Why would everybody be sent to their own time periods but her body goes to heaven? Seems a bit too silly.